If you’re in the mood for an applicious green smoothie, then you didn’t land here by mistake. Let’s quickly explore the health benefits associated with apples before we get to this delicious smoothie recipe. Apples are high in dietary fiber, vitamin C, and contain a relatively low amount of calories. Think perfect sweet snack, especially when on the go, or smoothie ingredient. Because of their hunger satisfying quality they’re good for weight loss. 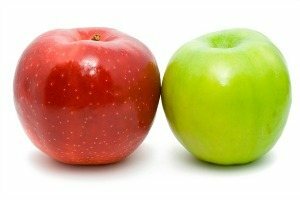 The unique balance of phytonutrients found in apples have been shown to provide powerful antioxidant properties, cardiovascular benefits, blood sugar regulation, anti-cancerous benefits, help with asthma, as well as reduce the onset and development of several age related illnesses. The antioxidant quercetin boosts your endurance, making an apple a great snack before exercising. For more information, see this web page outlining all the wonderful health benefits of apples. Use your favorite apple for this recipe. That’s Granny Smith for me. Enjoy! Put the ingredients into your blender and blend for anywhere from 30-45 seconds – or until the desired consistency is reached. Let me know what you think of this recipe, or if you try this amazing apple green smoothie by leaving a comment below. Happy Blending! 1cup apple juice is too much sugar for me. Anything to use instead or leave it out? I meant to say use water or coconut water unsweetened? Apple juice is too sweet for me too so I use ii sparingly. Both water and unsweetened coconut water are good alternatives.